A long, long time ago…ok, maybe not that long ago, the only thing you expected from contact centre agents was for them to provide quick solutions to pressing issues. But thanks to this fourth industrial revolution we’re having and new technology solutions, customers expect a digital experience when they contact support for assistance. Live Chat: While chatbots are efficient for the right type of issue, many customers still prefer the support of a live person. According to the Ovum survey, 53% of consumers wanted quicker access to live agents. By allowing access to live agents, contact centres can both cut support costs and increase customer satisfaction. Rules engines: Engaging visitors in live chat can be tricky as timing is always the gamble. Using a rules engine, this is no longer a guessing game as it automatically sends an invite to the consumer based on their website behaviour (i.e. links clicked on). 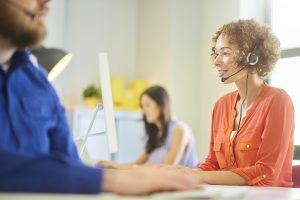 With most everything being a swipe up, down, left, or right, it’s only a matter of time before contact centres will cease to exist if new technology is not implemented. Contact VoiceFoundry today to find out how we can help your business maintain its existence.